Nasturtiums grow across the path. 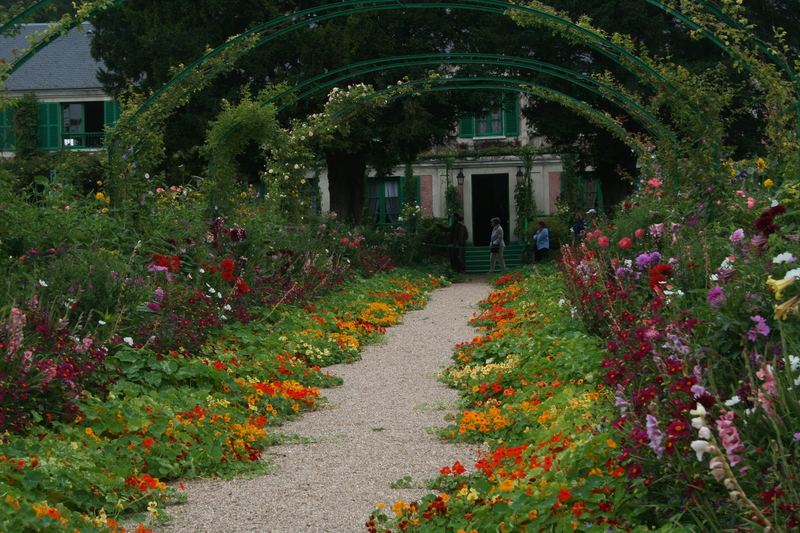 In early August, I had a chance to visit the garden of impressionist painter Claude Monet at Giverny, France. We were visiting our youngest daughter, who was studying in Paris. Being so close, I had to visit one of the most famous gardens in the world. The garden is lovely. (You can check out my gallery of photos here.) And, one of its most dramatic features is the Grande Allee, which means large path. Monet’s Grande Allee is edged with nasturtiums, which crawl across the path over the summer, sometimes covering the path in bloom. I love the look of plants flopping over the edge of a hard line, whether it’s a cement sidewalk or an 8-foot-wide path. It’s not exactly Monet’s garden, but I like the look of the plants growing over the sidewalk edge. This year, I had good luck with my annuals near the front walk. 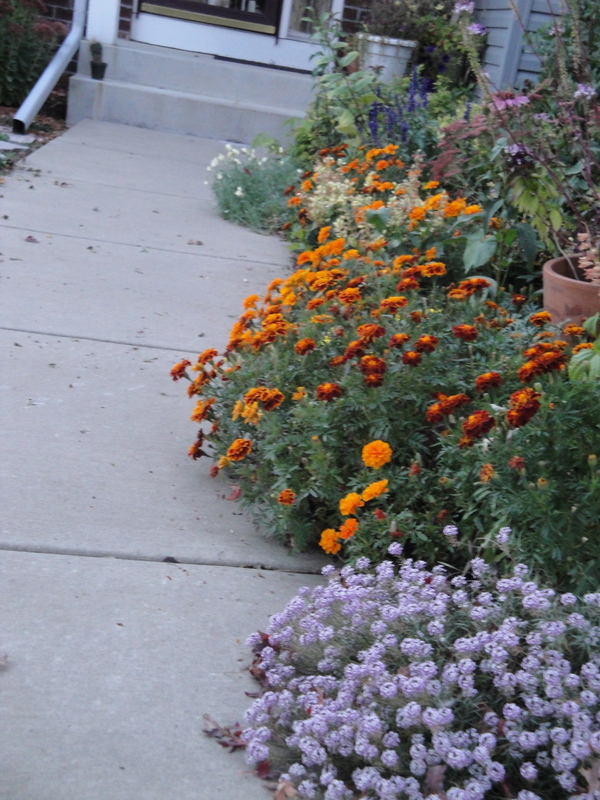 I like the way they grow just a bit over the edge of the sidewalk, joining the garden and the walkway visually. The alyssum is a new type from Proven Winners called Blushing Princess, a sister plant to Snow Princesss, which has a white flower. Both plants are supposed to grow large and bushy. I had mixed results with Snow Princess in 2011, but Blushing Princess, which will be available in garden centers in 2013, performed well, sending its pink puffs of flowers over the edge of the walk. I think it got more sun than the Snow Princess did, and that may be why it grew so well. The other plants are standard marigolds that I bought in mid-season at clearance prices. I did give them a good shot of fish emulsion when I planted them, and I’ve been diligent about deadheading. As a result, they took off, despite the midsummer heat. Not everyone likes the scent of marigolds, but I do, and that’s another reason to plant them near the walk. Way in the back, near the steps, is a cosmos I planted from seed that is still in bloom in mid-October.